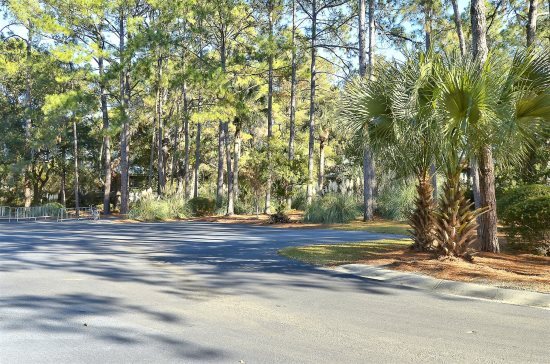 Beautiful Home, only 5 mins walk to the beach, easy walk or bike ride to Coligny Plaza! Filled with all the comforts and charm of the south, pristine interiors, its own pool and a spacious back deck sits 12 Ibis. A newly updated home with enough space to sleep 17, this home is the ideal accommodations for a fun summer excursion, a relaxing winter hideaway, a rejuvenating spring getaway, or even a restful fall break. Just about 15 steps lead to the very welcoming foyer, which opens to the cozy dining room furnished with enough seating for 8-10 comfortably. A hallway leads directly from the dining room to the chicly designed kitchen. The kitchen offers an island, stainless steel appliances, new granite countertops, and all the fixings in between to create gourmet meals and traditional family recipes. Four barstools line the breakfast bar, the perfect place to sip coffee and nibble on cookies while you plan your day’s adventures or catch up your favorite local magazines. The snug family room offers two matching sofas, one of which is a sleeper, two snug armchairs, one with a matching ottoman, a large flat screen TV, and even a desk and chair for the business exec with projects to complete while on vacation. Doors from the living room provide access to the deck and to the stairs leading down to the pool area; lie in the pool and cool down after lounging on the deck or use the grill to make heartening barbecue meals. There is also an outdoor shower under the house, easily accessible from the front of the house and the beach walk. There is also an open area under that home with a ping pong table, perfect for a friendly game. For your laundry needs, a washer and dryer is located just off the foyer for added convenience. 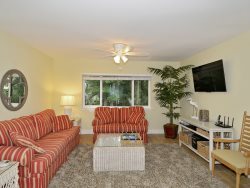 Located just pass the living room is a king bedroom with a private bathroom and a flat screen TV. All other bedrooms are located on the opposite side of the home including the mother-in-law suite with a king- size bed, a siting area with a sleeper sofa and rocking lounger, a private bath with a shower, as well as a kitchenette with a full- size refrigerator. This lovely home is only about a 5-10 minute walk to the beach and an easy walk or bike to Coligny Plaza with its numerous shops and restaurants. 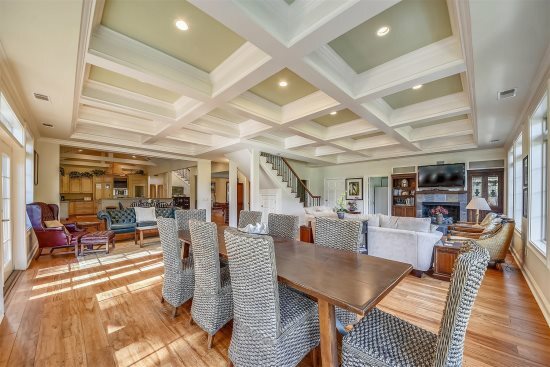 Make this home your island retreat. Your vacation awaits!